West Jordan puppy store and Sandy ordinance offer glimpse inside the pet adoption world. 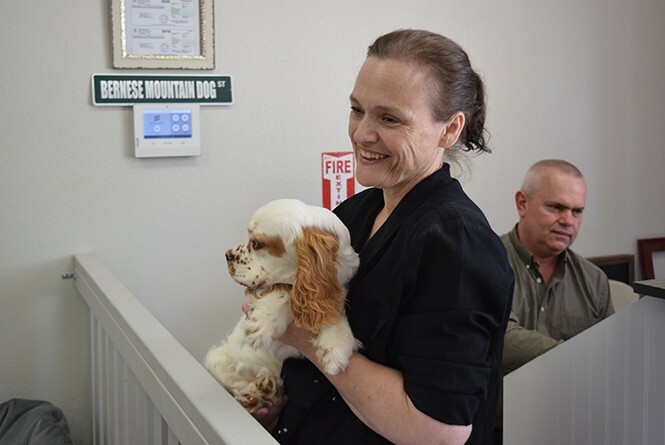 After facing opposition in Sandy, Lizzy hulet opened her new puppy store in West Jordan. Yips, yelps and barks ring out from within the small storefront in West Jordan. Inside is an overload of cuteness—puppies. French bulldogs, papillons, spaniels and other breeds hop about their pens vying for attention. Except there's a little more to the pups than their cute eyes, ears and licks. The store—Puppy Matchmakers—is open for business but its opening didn't come without a few hurdles in neighboring Sandy and a bout with the passionate animal-advocate community. And it ultimately led Sandy's city council to pass a law last week banning the sale of dogs that didn't come from a "city or county animal shelter or animal-control agency, a humane society or a non-profit animal-rescue organization," according to the new ordinance. In West Jordan, though, Puppy Matchmakers' owner Lizzy Hulet has found a place to do business that didn't leave her "with a bad taste in my mouth." That isn't to say there still aren't opponents of Hulet's business model. "Adopt, don't shop" advocates—like those that came to the Sandy Planning Commission meeting in February and turned Hulet away—vie for what they say are smarter adoption practices in a world that needs more regulation. "Their agenda is just to stamp out any stores that are going to sell puppies, going to sell kittens, anything like that," Hulet says, standing outside her shop on a recent Friday afternoon. "Where I understand and sympathize with a lot of their concerns, it was really frustrating because they didn't hear anything about how we're different—and we're very different." By different, Hulet explains, she tries to visit with breeders and see the environment the puppy is coming from. "If it's a huge multi-dog establishment, we're not going to buy our puppies there," she says, referencing puppy mills. She also says she won't take in puppies under 12 weeks of age—a time when their immune systems are still developing. But those on the other side—the Humane Society of Utah, Best Friends Animal Society and countless other adoption advocates—warn that because places such as Hulet's can still operate in cities with lax regulations, they want to educate the public on "adopt, don't shop." "If you think of a Petco or PetSmart, they never sold [puppies] to make a profit," Deann Shepherd, communications director with the Humane Society, tells City Weekly. "They always worked in a community ... instead of profiting on pets and buying from puppy mills, they support shelters to adopt from their facilities." Puppies inside Hulet's store are listed at prices as high as $2,400 for a French Bulldog. While Hulet says she wouldn't mind bringing pets in from a local shelter, she says shelters won't bring them to stores that also have dogs from other sources. Hulet's husband is from Ukraine and she says they have family that help bring puppies from that region as well. Ian Williams is the director of Animal Services in Sandy. During his tenure, the shelter has transitioned to a no-kill facility. He also advocates for better adoption practices such as outlined in the city's latest ordinance. "If a brick-and-mortar store is to open, they need to source their inventory—their animals—from a qualified rescue or a municipal county shelter," he says about the ordinance. "So, it helps us by moving the animals we have in our care and custody out to points of contact—it's a further means of networking for a shelter." Last year, the shelter had a 99 percent save rate for dogs and a 93 percent save rate for cats, Williams says. They only had to euthanize one dog for age- and illness-related reasons. The brick-and-mortar adoption model, though, is one Williams says is a dying breed. "It seems like society wants more animal care and control and for us to provide them a higher level of service than they've experienced in the past," he says. "The efforts of the city council help set that policy." For some people like Sandy resident Wendy Mortensen, their experiences with previous pet stores have led them to be vocal advocates for the swelling adoption vs. purchase model. Mortensen is a member of the Facebook group "Puppy Barn Victims," that has more than 2,000 followers. The Puppy Barn is a pet store that recently moved from American Fork to Saratoga Springs and has drawn similar criticism for its business model, according to reports in Provo's Daily Herald. Mortensen says she adopted her puppy from there in 2015, but ended up having to spend hundreds of dollars in veterinarian bills because it was infected with parvovirus, a common disease that spreads easily among puppies. When she heard about Hulet's store possibly opening in Sandy, she and dozens of others decided to attend the February meeting. Mortensen says she has "nothing against responsible and ethical" breeding, but worries about some of the dangers adopting from a store. "Honestly, I know people always say, 'Well, they're just against selling at all,'" Mortensen says. "But there is a huge difference between ethical and responsible breeding versus what Puppy Barn does." According to the Daily Herald, city officials with American Fork would respond to complaints about the store, but came "back clean every time." Mortensen says she was upset with her experience at Puppy Barn because there was little customer protection—the vet costs she incurred, for example—and she doesn't want to see it happen to other families. Until then, animal advocates and city councils will be taking on the "adopt, don't shop" campaign themselves. "The ordinance, we're hoping, encourages people to support adopting from a shelter or rescue," Shepherd says. "It's not to shut down any stores, but a step in the right direction to make people aware they have to question where that puppy is coming from—it's a buyer-beware world."